Wanted to unclutter by rear end, so I thought I'd relocate the license plate. 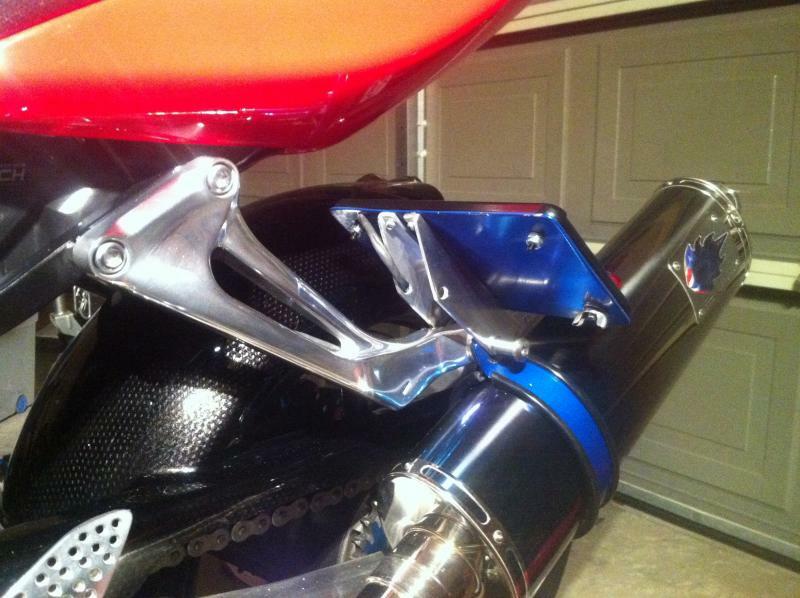 Had some scrap aluminum laying around, so made some brackets, & backing plate. Purchased a license plate holder with LED's built in. 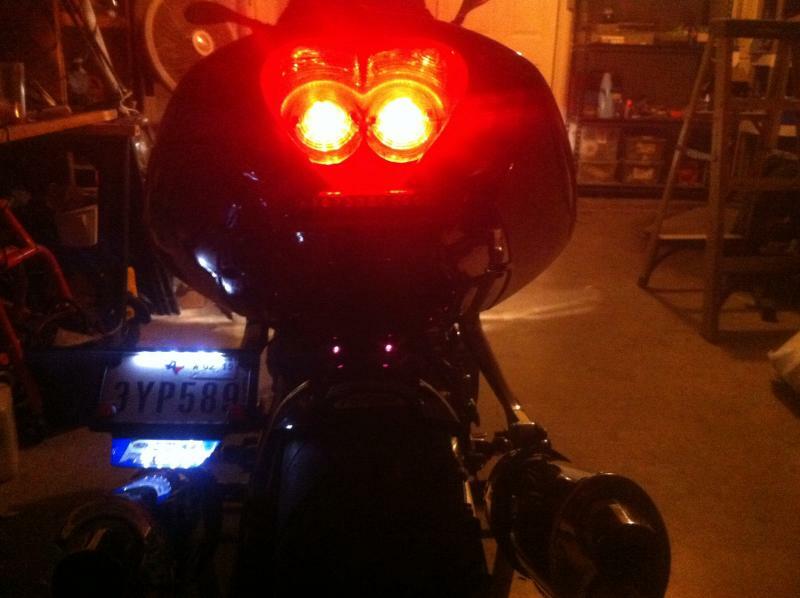 What brand is the undertail and lights? I have the same one and there is no information on it. Is the hugger custom? If a cop was directly behind you, can he see the whole plate? Looks like the muffler is in the way. Yea, I'm not a hundred present sold on the location, at this time. Kind of takes the "center" out of things. Will give it bit, if I don't like, i'll put it back to original. 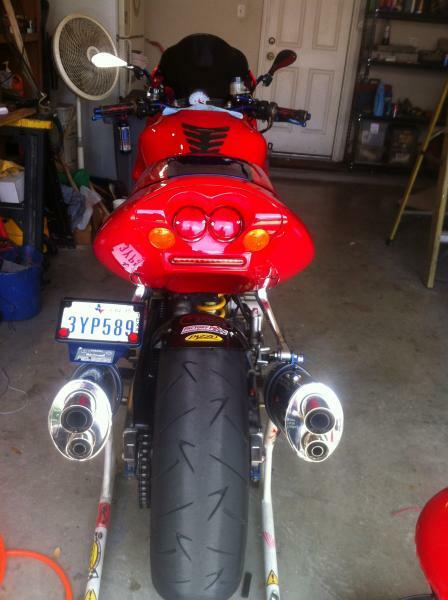 NZSpokes, got the undertail from Extreame Moto Graphics, about 9 yrs. ago. brakes, & turn signals came on it. Added the extra straight break light. Cheers. My bike came from the US in 2006 so that would be right timing. Plate is visible, at 2 cars lengths, unless their in a low rider. Thinking they could be a little higher. There is another 2.5 in. of clearance. Let's see, where did I put that scrap. Other than going up, could go further to the left, but don't want to do that. May just take my chances. I've gotten out of a couple of tickets before, after removing my helmet, & they see I'm a 60 yr. old man. Mooster, is yours been been changed much under the seat? Mine has been roughly done and am thinking of ways to tidy it up.